← Happy as a clam! I came across an article this week, about ways in which Japan will surprise travellers. There are a pieces of the article that are very accurate. The “expensive, yet affordable” bit is right on the money. Unfortunately I think the article falters in the same places that so many pieces about Japan struggle. It does well in describing Tokyo, but it makes sweeping generalizations that just do not hold up outside of the major cities. It reiterates all of the usual clichés about Japan: Technology! Tradition! Nintendo! Kimono! However, despite the title, I was disappointed that the article fails to dig deeper and find the aspects of Japan that might actually surprise travellers. The following is my take on the situation, how Japan continues to surprise me. This first heading almost made me do a spit-take. “Stylish in ways I have never seen” is exactly how I would describe Japanese fashion, but I don’t think the author is using it as a euphemism, at least not in the same way I do. The author discusses “looks that reveal detailed attention to beauty and a person-as-canvas philosophy.” In Tokyo and Kyoto, where the author seems to have travelled, I will admit that fashion is spectacular. However, travellers leaving the major urban centres may be surprised to see that the rest of Japan is not stocked with Harajuku girls. When I first arrived in Toyama I remember being struck by the prevalence of Crocs. To be fair, they are a very practical choice of footwear in one of the rainiest parts of the country. Still, I think we can all agree that Crocs do not belong in a conversation about style, even (especially) if they are Hello Kitty-themed. Yet crocks are a staple of Japanese fashion, at least in my corner of the country. Japan has had ultra fast bullet trains connecting major urban centres for decades now. On the flip side, the train I take to work looks like it could have been an alternate home for the Boxcar Children. Just as with fashion, technology outside of the major cities in Japan can take you back in time, to a time when everything was a bit slower, and a lot less convenient. The best example is money. Japan is a cash-based society. Perhaps because of low crime rates, people have had little push to move towards alternate forms of payment. Almost no small stores accept credit cards, internet banking is relatively uncommon, and a debit card system is unheard of. Instead, people carry around massive amounts of cash, a bank card and their bankbook. Yes, you read that correctly, a bankbook, like the one I received when I opened up My First Bank Account in 1988 and promptly lost because it was already becoming obsolete. In the CNN article, the author discusses the architectural wonders of Japan’s cities, as well as the beauty of the country’s gardens and temples. All of this is true. However, what really surprised me about Japan was its natural beauty. The Japanese summer provides some of the lushest green landscapes I have ever seen. If you step outside of the city you will be surrounded by endless rice paddies. In Toyama we are spoilt by mountain and ocean views. As a Canadian, I have a tendency to be a snob when it comes to natural wonders, but Japan can certainly hold its own in terms of rural landscapes. The cleanest place in the world. And no review of Japan’s virtues would be honest without mentioning Japan’s toilets, a marvel of modern technology and a cause for profound gratitude from travellers This is no place for a disquisition on Japan’s sanitary technology other than to offer a heartfelt arigato. Thank you. Ok. I agree that Japan is amazingly clean. I also agree that any review of Japan ought to mention toilets. However, I don’t think the two thoughts belong side-by-side. Not because the toilets are unclean; by global standards they are immaculately kept. The issue is that toilets merit an entire chapter. 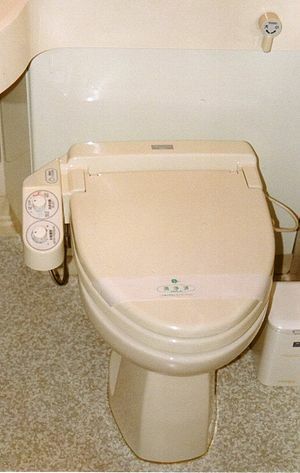 It is true that many Japanese homes and businesses have beautiful, western style toilets. The toilet seats are often equipped with heating and other rear-pampering luxuries, which really deserve an entire post to explain. (In the context of a Japanese building with no central heating, for example, a heated toilet seat seems much less extravagant.) However, the flip side is that many public wash-rooms have traditional squat toilets, which can be daunting to unsuspecting Westerners. There is a hilarious, but useful wikiHow about mastering the squatter. Like in some other parts of Asia, public toilets in Japan often do not have toilet paper. Sometimes there is a dispenser outside of the stall, but it is wise to always carry tissues on your person. Soap is also a rarity in Japanese public restrooms. For a country that insists on wearing masks the second somebody sniffles, there is a shocking lack of soap in public facilities. Hand sanitizer will become your best friend. All of these things, good and bad, are just a part of living in Japan. I rarely think about any of them in daily life. Well, except for the toilet paper, it is important to keep that one point in mind, lest I be caught unprepared. The internet if full of Crazy Japan stories, but my experience here has not been all that crazy. Almost everything that has surprised me at first has made sense once I learned about the cultural background. Again, except for the toilet paper issue; I still don’t know why toilet paper is not amply supplied.